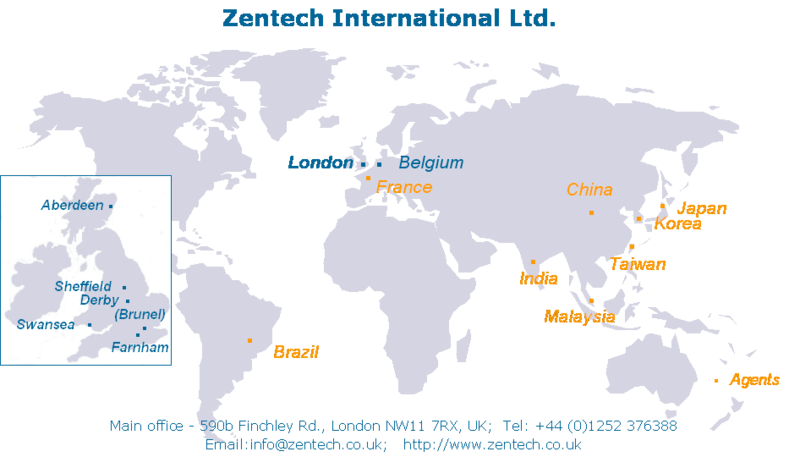 Zentech International Ltd. (Zentech) is an independent engineering consultancy and software development company. Established in the UK in 1980, the company provides a wide range of services including design, structural integrity assessment and detailed analyses at component level to various industries including Aerospace, Nuclear, Offshore Oil & Gas and Power. Zencrack: Develops focussed finite element meshes at crack tips and evaluates fracture mechanics parameters (e.g. stress intensity factor, energy release rate). Uses these parameters to carry out 3D crack propagation simulations, assessment of crack initiation fracture toughness, residual life prediction and to help create failure assessment diagrams. A range of loading histories is supported for general fatigue and creep loading systems. The software is interfaced with Abaqus, Ansys and NX-Nastran finite element codes..
ZenRiser: Performs non-linear dynamic analysis for design and analysis of flexible riser and umblical configurations. This also includes installation of large diameter HDPE outfall pipes by a floatout and sink method. Pipeline: Pipeline performs fast 3D static, non-linear stress analysis of various situations encountered during offshore pipeline installation and operation. This includes pipe laying using a barge with stinger or ramp.